Jaded Blossom: Happy Birthday Princess! To hold the pez candies, I used the Jaded Blossom ~ 3x4 inch clear bags. To make the toppers I used the Jaded Blossom ~ Dainty Topper Die. 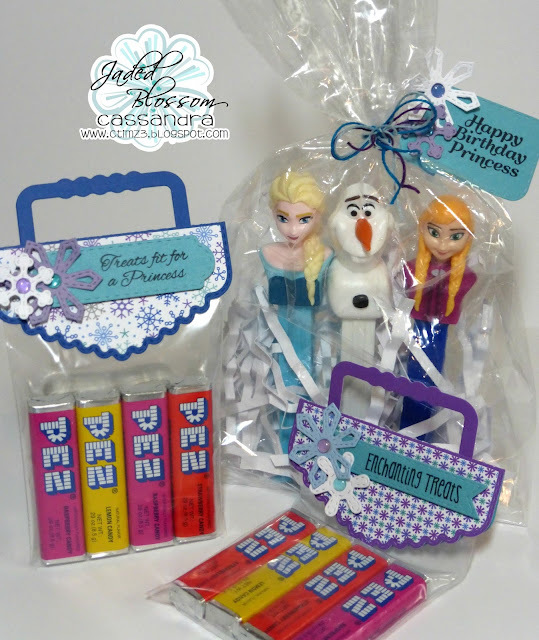 To hold Anna, Elsa and Olaf, I used the Jaded Blossom ~ gusset bag. For all of the tags, I used the Jaded Blossom ~ Mini Tag Dies 2. The sentiments are all from the Jaded Blossom ~ 100% Princess. And to decorate the tags, I used the snowflake dies in the Jaded Blossom ~ Winter Dies. These little goodies are a perfect example of how AWESOME Jaded Blossom products are to decorate your treats and gifts! What an adorable gift set. She will love it. Love this. What a fun gift.